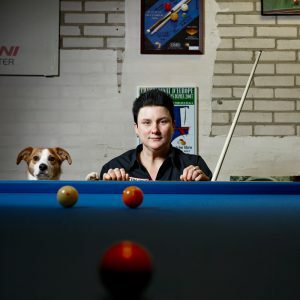 Therese Klompenhouwer was raised in her father’s café, where she first learned about billiards. 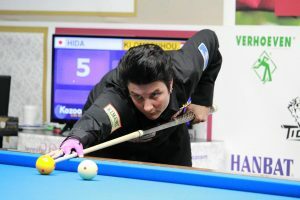 From the age of 8, she already played billiards. At first the game libre, but at the age 19, she switched to 3-cushion. A logical step, as she already had been a “sparring mate” for her brother Jarno for a while. 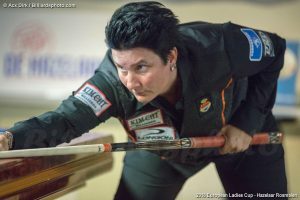 Soon afterwards, she ended up with trainer Christ van der Smissen and he and the KNBB (The Dutch Billiards Federation) selected her for the national Dutch team. Today she is still part of the Dutch selection, however now under the direct leadership of Raimond Burgman. At the moment she owns 11 Dutch titles, 8 European titles and 3 World titles, which makes her one of the most succesfull female players of the world.